If you have been a reader here for awhile, then you will have noticed my love for baking. Being the baker that I am, I am constantly on the lookout for innovative and new ways to make yummy foods for my family. Not to mention the fact that I am looking for HEALTHY recipes too! If you have a love for all things healthy and sweet, then you are going to love this next review! Olive Oil Desserts is a cookbook that focuses on using Olive Oil rather than butter, margarine and shortening for baking. Honestly, I had never heard of using Olive Oil for baking before learning about this book. In fact, when my mom was visiting the other day I asked her if she had ever baked with Olive Oil and her response was "Once...by accident!". My mom is a WONDERFUL cook and baker and it doesn't really surprise me that she had never baked with Olive Oil before. Let's face it. When you think of Olive Oil your brain probably automatically switches to Italian foods and sauteing veggies or pasta. So, you can imagine my delight when I discovered Olive Oil Desserts! 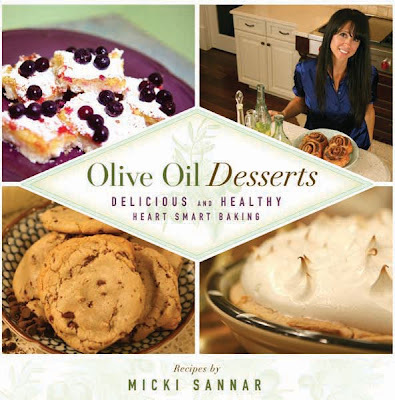 In Olive Oil Desserts, Micki will teach you the basic facts of baking with olive oil. The recipes in this book are easy to follow. Olive Oil Desserts contains many mouth watering color pictures, cooking tips and delightful stories. There is also a section where Micki teaches you how to substitute milk, eggs and even whole wheat flour for lactose or vegetarian diets. Olive Oil Desserts takes advantage of the fact that olive oil has been named the healthiest oil on earth. It is loaded with monounsaturated fatty acids (MUFAs). These MUFAs are what lower your LDL "bad" cholesterol. Many medical studies have proven that olive oil reduces the LDL "bad" cholesterol and aids in the fight against heart disease. Olive oil contains numerous plant compounds. These compounds help to increase enzymes that block activation of carcinogens and aide in their removal from the body. Olive oil is loaded with polyphenols, a powerful antioxidant that promotes heart health and the fight against cancer. There are no Trans fats or hydrogenated oils found in olive oil. I love how this cookbook is set up. The pictures are gorgeous and very detailed and the whole book has a very elegant "feel" to it. All of the recipes are easy to understand and in the back of the book, Micki has included an glossary of terms so if you see a word you are not familiar with, you can simply refer to the glossary. I LOVE that! 1. Preheat oven to 375 degrees F. Lightly coat large cookie sheet with olive oil cooking spray. 2. In a mixer bowl add olive oil, sugar and brown sugar. Blend until smooth and creamy. Beat in eggs, vanilla & butter extracts, and milk. 3. Add flour, baking soda and salt. Blend well. 4. Fold in chocolate chips and pecans. Drop by rounded tablespoonfuls or medium sized cookie scoop onto prepared cookie sheets. 5. Bake 9-11 minutes. Cook on wire racks. Mandatory Entry:Visit Micki's Website and tell me something interesting you learned there. You do not have to be a blogger to enter, but you must have a valid email where you can be reached should you win. If you do not leave an email address, it must be where I can easily find it. This giveaway is open to US residents and will end 3/31 at 11:59 pm EST. The winner will be chosen using random.org and will be notified by email. The winner will have 48 hours to respond, or another winner will be selected. 5. Follow Micki on Twitter. 1 entry. Disclaimer: I received no monetary compensation for this post. I did receive an Olive Oil Desserts Cookbook for review purposes. All quotes are from the Olive Oil Desserts website and email. All thoughts and opinions are mine. Olive oil is the only vegetable oil that can be consumed in its natural form. This is all so interesting. I didn't even think about using olive oil in baking! I like Olive Oil Desserts on Facebook. I learned that olive oil desserts can have 30% fewer calories! Micki does in home cooking classes, large or small events presentations and even phone consultations. I learned that you can reduce your Trans fat intake and increase your good fats while enjoying luscious chocolate cake, rich pecan pie, delicious sweet breads and many more family favorites. i loved reading that there is a section where Micki teaches you how to substitute milk, eggs and even whole wheat flour for lactose or vegetarian diets! The reason that olive oil is so healthy for you is because it contains a high amount of monounsaturated fat, it is high in antioxidants, and contains phenols. Studies have shown that olive oil aids greatly in the protection against heart disease. I am just amazed to know that you can bake all those goodies using olive oil instead of butter. Her brownie recipe looks delicious! I think I will try it...now!! Olive oil has been known to be beneficial to combat ulcers and gastritis, and activates the secretion of bile and pancreatic hormones much more naturally than most all other gastric drugs. I learned that olive oil is a natural juice which is extracted from the olive ususally by cold press. i learned olive oil can cut cancer risk. I'm following you on Twitter @AsTheNight. I'm following Micki on Twitter @AsTheNight. I liked Olive Oil Desserts on Facebook. I learned that there is also a section where Micki teaches you how to substitute milk, eggs and even whole wheat flour for lactose or vegetarian diets. 1 i posted your giveaway on my blog! 2 i posted your giveaway on my blog! 3 i posted your giveaway on my blog! 4 i posted your giveaway on my blog! 5 i posted your giveaway on my blog! I am a follower!!! GFC. I learned that Oil Desserts contains many mouth watering color pictures, cooking tips and delightful stories. I learned that cooking with olive oillowers the amount of transfats! What a great and pleasant way to get more healthy oil into a diet. I learned that there are four grades of olive oil. Extra virgin, virgin, pure and extra light. I learned that Olive Oil has been known to combat ulcers and gastritis....very interesting! This cookbook sounds great, as I do follow a healhty lifestly but have never thought of baking with olive oil! Thanks! I learned how to make Pecan Coconut Bars...my sweetie will love 'em! i learned that Studies have shown that olive oil aids greatly in the protection against heart disease. I learned there are many recipes that will substitute ingredients to make for lactose free and vegetarian recipes. That is neat! I learned that olive oil is the only vegetable oil that can be consumed in its natural form. I follow Micki on Twitter under the username likwan. I follow Olive Oil Desserts on Facebook under the username likwan. I tweeted about this giveaway at http://twitter.com/likwan/status/53664648821620736.